In this episode, Yahnathan continues his discussion with author Starr Burroughs by addressing the question: Can we change what we are attracted to? 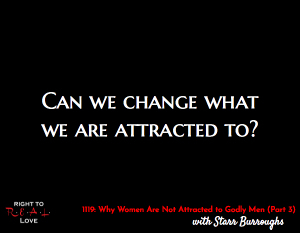 Can we change what we are attracted to? The importance of know what we are not attracted to and why. How our attractions can change. The value in drawing closer to Yah and how He can help us positively change the things we are attracted to.